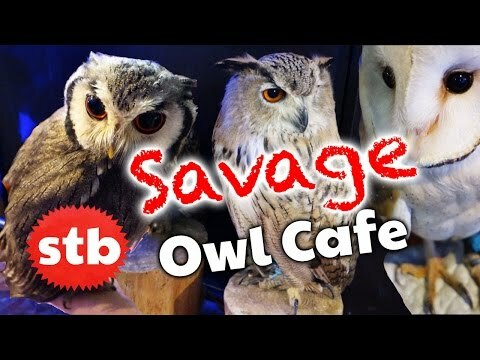 ► Check out the next Animal Video: http://bit.ly/1O9SeMx Here's an owl cafe in Akihabara, Japan. The concept? Pay a little money to spend time with owls. Now aside from some kawaii owls, this place had some pretty buckwild decor poppin' off. There was even booze available in this place. In other words, that was a pretty nice Japanese cafe right there. Cafe Name: "The Forest of Owls" Address: 4 Chome-5-8 Sotokanda, Chiyoda-ku, Tōkyō-to 101-0021 5th floor Hours: 2pm-11pm (Wednesdays 5pm-11pm) Join SoloTravelBlog's Other Networks: ► The Blog: http://solotravelblog.net/ ► Twitter: https://twitter.com/TravelSoloBlog ► Instagram: http://instagram.com/solotravelblog ► SubReddit: https://www.reddit.com/r/solotravelblog/ ► Facebook: https://www.facebook.com/SoloTravelBlog ► Google+: https://plus.google.com/+SoloTravelBlog/ ► Patreon: https://www.patreon.com/solotravelblog SoloTravelBlog is international travel with a buckwild edge. Currently, I'm living in Japan and exploring all the weird and wonderful things this country has to offer. Subscribe for more updates on my exploits in Asia, baby. * ~ * ~ * ~ * ~ * ~ * ~ * ~ * ~ * ~ * ~ * CAMERA & AUDIO EQUIPMENT I USE: Camera: Sony RX100 M3 ► http://amzn.to/2sLZDis Voiceover Mic: Samson Go Mic ► http://amzn.to/2sSc3FY In-Field Mic: Zoom H1 ► http://amzn.to/2sLXovV Tripod: Manfrotto Pixi ► http://amzn.to/2sLNrOX EXPLANATION: I try to keep my equipment as simple as possible. 90% of the time, all I use to film is my Sony RX100 M3, and all I use for audio is my Samson Go Mic (which I use to record voiceovers after filming). Occasionally I use the Zoom H1 for audio if I want to record audio in-field. As for the Pixi tripod, I sometimes use it while filming food, but most of the time I use it to mount my Samson Go Mic on a desk for voiceovers (in conjunction with the other accessories, listed below). MODULAR COMPONENTS I USE: Smatree SmaPole S3 (hollow pole only) ► http://amzn.to/2sLI7ee Joby Action Arm (arm only) ► http://amzn.to/2toE0CN Joby Hand Grip (hand grip only) ► http://amzn.to/2sSe3y0 Joby Hub Adapter ► http://amzn.to/2toDJ2E EXPLANATION: Because I'm often traveling, I prefer to have the lightest, smallest, most versatile components available. Therefore, I use bits and pieces from the above gear sets, and these bits and pieces can be connected together in a huge variety of ways. For example, they can be made into a long selfie stick, they can be mounted to my tripod to make it extra-tall, and they can be used with my tripod and Go Mic to position the microphone directly in front of my face while I'm recording voiceovers at a desk. MICROPHONE ACCESSORIES I USE: Foam Mic Cover ► http://amzn.to/2sSagRo Pop Filter ► http://amzn.to/2sSJSHf EXPLANATION: To improve sound quality for voiceovers, I place a mic cover on the Samson Go Mic, then use an elastic band to hang the pop filter on top. This is not the best audio protection available, but it is the most minimalistic and space-efficient gear for traveling. The mic cover can also be used on the rare occasion that I record audio with the Zoom H1. GEAR I USE FOR CHARGING ON-THE-GO: Anker Mini PowerBank ► http://amzn.to/2sHy8HZ Silicone Cables ► http://amzn.to/2tgXf1i Adapter for Micro to Mini ► http://amzn.to/2sEhlVm Adapter for Micro to Lightning ► http://amzn.to/2sMBGbd EXPLANATION: Anker's lipstick-sized powerbanks are small yet powerful. I travel with two, so that if one has a low charge, I can charge it in my hotel while I'm out and about with the other powerbank. Using the powerbank in conjunction with the short, durable silicone cables and micro/mini/lightning adapters means I can charge just about any device while on-the-go. * ~ * ~ * ~ * ~ * ~ * ~ * ~ * ~ * ~ * ~ * Disclaimer: Links I have posted to Amazon.com are affiliate links. I make a small commission on sales from Amazon.com, and this helps to support SoloTravelBlog. This video is not sponsored, and I have purchased all products mentioned above with my own money.